The situation in UP's Kanpur district was being closely monitored, a senior official in Lucknow said. Police and Rapid Action Force were deployed to control the clashes after Muharram. 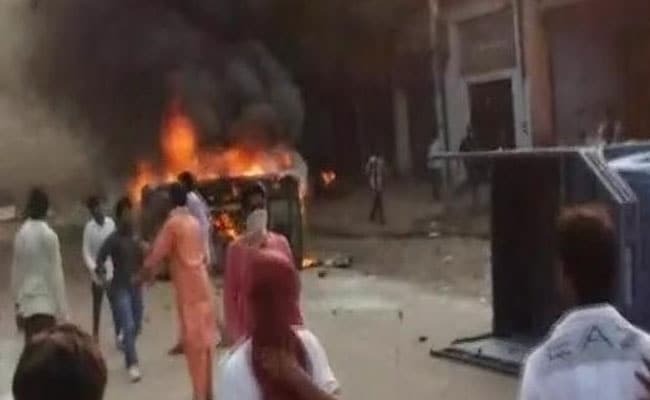 Kanpur/Ballia: Tension flared in the Parampurva area in Uttar Pradesh's Kanpur district after six people were injured today in a clash during a Muharram procession that saw members of two communities throwing bricks at each other and setting vehicles on fire, the police said. The incident occurred when the procession deviated from its fixed route. Perturbed, some members of another community started throwing stones at it in Parampurva, police officer Alok Singh told news agency PTI. Two cars and four motorcycles were set ablaze during the clash, he said. Police resorted to batons to bring the situation under control, the officer said. He said three persons were injured in the incident. Four companies or around 400 personnel of the Provincial Armed Constabulary (PAC) and a company of the Rapid Action Force (RAF) have been deployed in the area to maintain peace. A senior official in Lucknow said the situation was being closely monitored. A similar incident happened in Rawatpur village in the district, but it was stopped before turning ugly. In Ballia, nearly half-a-dozen people were injured after members of two communities clashed over a petty dispute related to children in the Sikandarpur area, an official said. The incident occurred last evening at a Durga Puja fair, District Magistrate Surendra Vikram said. A minor quarrel between two children took an ugly turn after their parents and members of the two communities got involved. "There were reports of stone pelting," Mr Vikram said. He said the police reached the spot and controlled the situation. "Police and provincial armed constabulary (PAC) personnel have been deployed at the spot. The situation is under control," he added.